The Super Bowl is almost here. 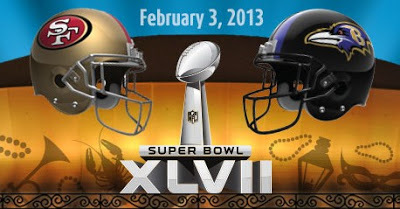 Have you planned for a party in your home to watch the match up of the Baltimore Ravens and the San Francisco 49ers? According to the recent Big Game Survey conducted by Century 21, 84 percent of Super Bowl viewers will be watching the big game in a home, either their own or the home of a close friend this year! Maybe even YOUR home! What can you do to plan for a great experience? Review the ten tips below to see if you can incorporate a few of the ideas and host a winning Game Day in your home. Food - Finger foods and plenty of drinks are necessities to this event. Place some near viewing areas and have other eating and drinking areas so guests can mingle away from the game, too.Seating - Make sure you have enough chairs. You could even host a bring your own chair decorating contest to ensure that both teams are represented at the party.Sound System - Test it out first keeping in my mind that as the game progresses, your guests’ cheers may get louder.Big Screen - Have you set up multiple viewing areas or is your television screen large enough to accomodate those you’ve invited?Friends - Mix it up – invite neighbors, co-workers, new friends and old stand-bys. Everyone loves a good game!Set Up a Serious Watching Vs. a General Watching Station - Not everyone like the noise of a group when watching the game.Decorations - Spruce Up your home with flags or balloons in team colors and other assorted favors. Make it fun! You could even cut out flags for your guests to throw throughout the game, too!Kids? & Activities - Plan activities and babysitters for kids that will have them enjoying Game Day, as well. Perhaps enlist them in creating their own half-time game show to be seen after the game? Make score cards for rating the best Super Bowl commercial and pass them out as guests arrive and have them guess the score and winner as they walk through your door.Parking - Warn neighbors about potential parking issues and let guests know where to park, too.Reminders/Invites - Send out invitations and last minute reminders to ensure that your party is well attended and the talk of the town!